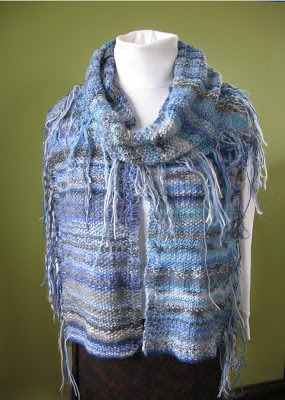 With the final 2 rows of sky and a bind off, the Sky Scarf, Ryan Seacrest and I welcomed in the New Year. My 2012 Sky Scarf measures 102" (not blocked yet) and the fringe—created from the tails of the yarns at a change of color—is still a work in progress. I need to find a solution for finishing the fringe. Actually, I rather like the loose, whisky bits that cascade from one edge, but it needs to be more secure. I'll do some research as well as seek suggestions from guild members of my fiber art guild on possible options. So, when the finishing touches are added to this year-long project, I'lll do a recap of the journey. Until then, I hope your 2013 is filled with inspiration, happiness and time to enjoy doing something that you love. Stunning. A do-it-yourself historical record!